If you could 'like' our 3 fb pages in the right hand column to the right of the page we would appreciate it. Thank you. The With Compassion & Soul fb page has daily posts about ALL animals, we post information, petitions, fundraising campaigns, project news, photos and many other things of interest. The SAVE Orangutans fb page has daily posts about orangutans and the Palm Oil Issue, we post information, petitions, fundraising campaigns, project news, photos and many other things of interest. 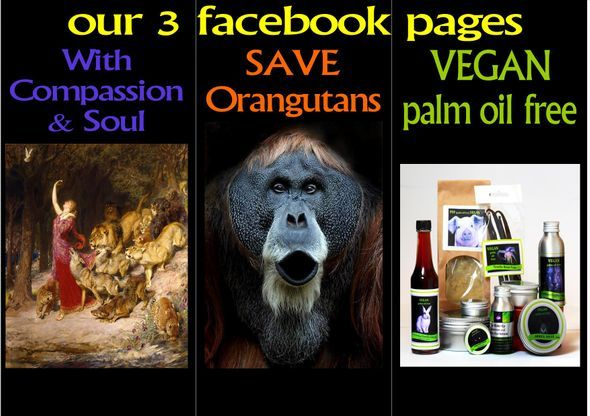 The VEGAN palm oil free page has daily posts about palm oil free products that we make to raise funds for animals, vegan palm oil free merchandise that we sell to raise funds for animals. We also post information, petitions, fundraising campaigns, project news, photos and many other things of interest. The ORANGUTANS page has only positive photos of orangutans & information about orangutans. I am sick to death of pages posting as a graphic an image as possible just to collect 'likes' on their fb pages, personally I just think they are 'like' whores and use cheap & lazy shots to build their page and by doing so they torture, main, kill the animal all over again by using their suffering to gain 'likes'. It is fair enough to have a graphic photo accompany a story if it is a new story but 'like' whores go back into their timeline album and find which graphic posts gained the most 'likes' and post them over and over again. We all know those pages. Well this one only has positive images so you can always look at it knowing you won't be distressed by what you may see.